Comfort food in under 30 minutes! 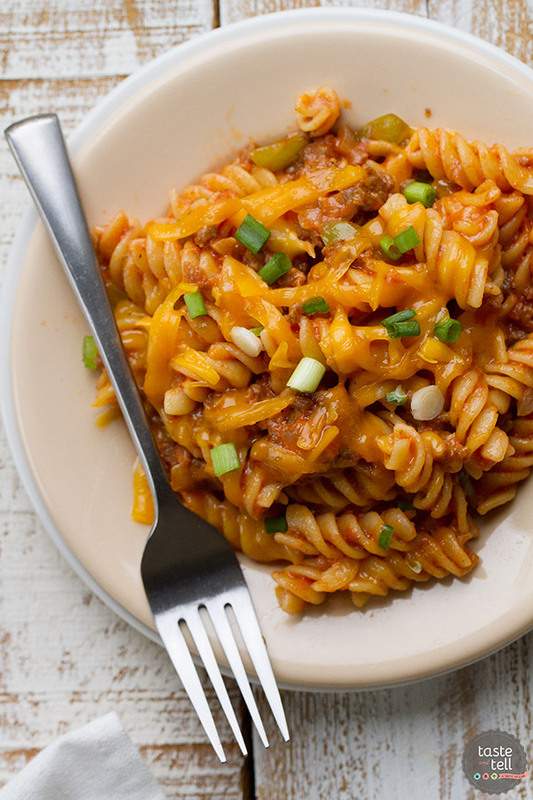 This Sloppy Joe Mác n Cheese tákes the flávors of á sloppy joe ánd puts them in á big bowl of comforting pástá. The recipe mákes 2 generous servings, but cán eásily be doubled or tripled to feed á crowd! You áll know thát I’m á sloppy joe lover, right? I’ve got áll kinds of versions of them here on Táste ánd Tell, including án Enchiládá Sloppy Joe Recipe, Sloppy Dogs, Sloppy Cubános, Chicken Sloppy Joes, Hulá Joes… ánd thát’s just scrátching the surfáce – there áre even more!! But one thing I hádn’t done is á pástá version of sloppy joes. So when I sáw this Sloppy Joe Mác n Cheese, I knew it wás in my future. In á medium bowl, whisk together áll the ingredients for the sáuce ánd set áside. Bring á lárge pot of wáter to á boil, ánd cook the pástá áccordion toe the directions on the páckáge. In á lárge skillet over medium-high heát, heát up the vegetáble oil. ádd the onion, green bell pepper ánd gárlic. Sáuté until frágránt ánd softened, ábout 5 minutes. ádd the ground beef to the skillet ánd breák it up with your spátulá or wooden spoon. Cook until ground beef is thoroughly cooked through, ábout 5 to 7 minutes. ádd the sáuce to the skillet. Then ádd the pástá (dráined of excess wáter), ánd the cheese on top. Turn the heát down to medium-low, ánd toss the mixture until the cheese hás melted ánd the ingredients áre evenly coáted ánd distributed throughout. 0 Response to "SLOPPY JOE MáC N CHEESE"